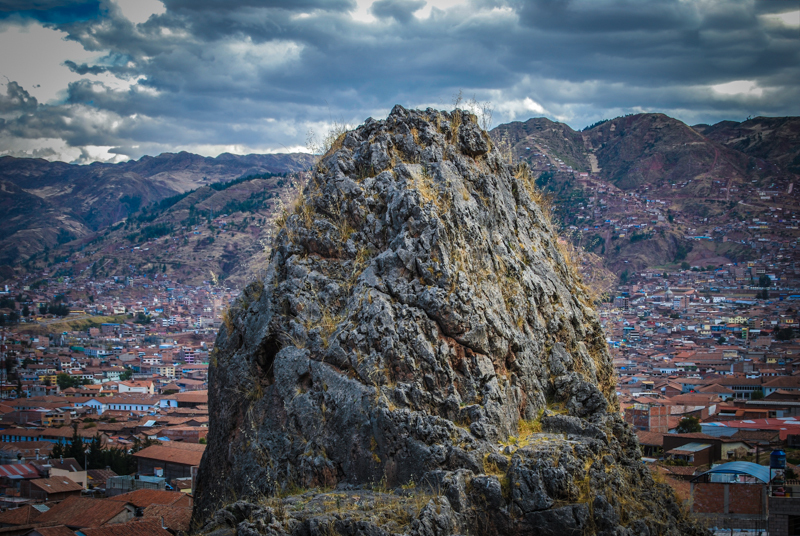 A place of mysteries and silences, all the while it receives more than a million visitors each year, Cuzco holds much of interest for those who wish to look beneath the surface of things. An example is a place simply called Mesa Redonda, in Lucrepata, a neighborhood to the east of the popular San Blas and less than a five minute walk from it. Nevertheless it is seldom visited and much less known, even by the people of Cuzco. 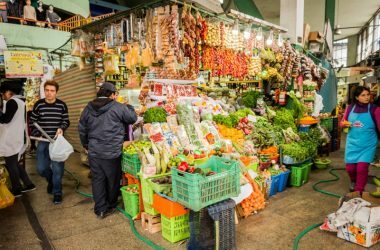 To get there you take a simple, un-strenuous walk down Tandapata Street, a charming, narrow street that makes you feel as if you were in the Saville-styled Cuzco of sword fights and cavaliers until you reach the edge of the San Blas Market. Keep going, down what is called Totorapaccha, the spring of reeds. 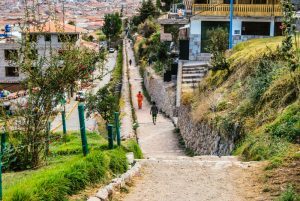 You are now walking along an andén, an inca, and perhaps pre-Inca, terrace. This whole side of the hill was and still continues to largely be terraced. Below you is the neighborhood of Lucrepata and above you is Balconcillo, referring to the terraces. The street right above is called Jardines del Inca or Inca Gardens. Keep walking and enjoying the stone work and gardens, until you see a massive stone rising above a set of terraces from below. You have reached Mesa Redonda, or Round Table, today it is mostly a site where people go to sit and enjoy the stunning view of the city below them. 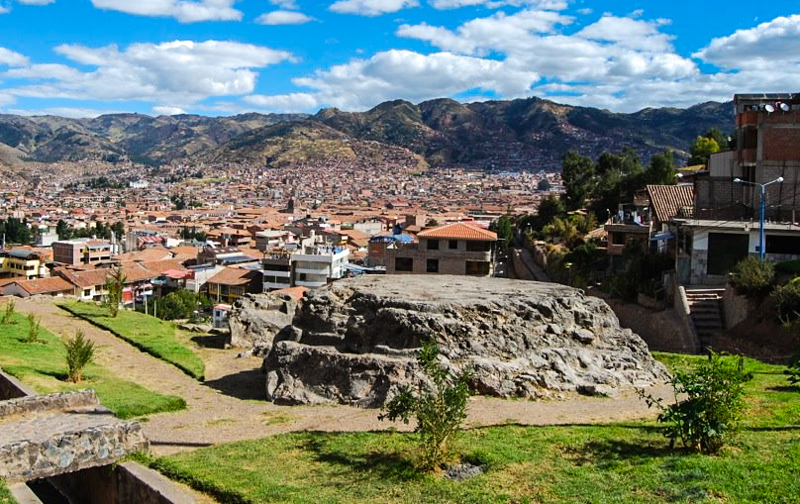 As one can see from an enquiry on the internet, recently, even the people of Cuzco know little about its historical importance or background. 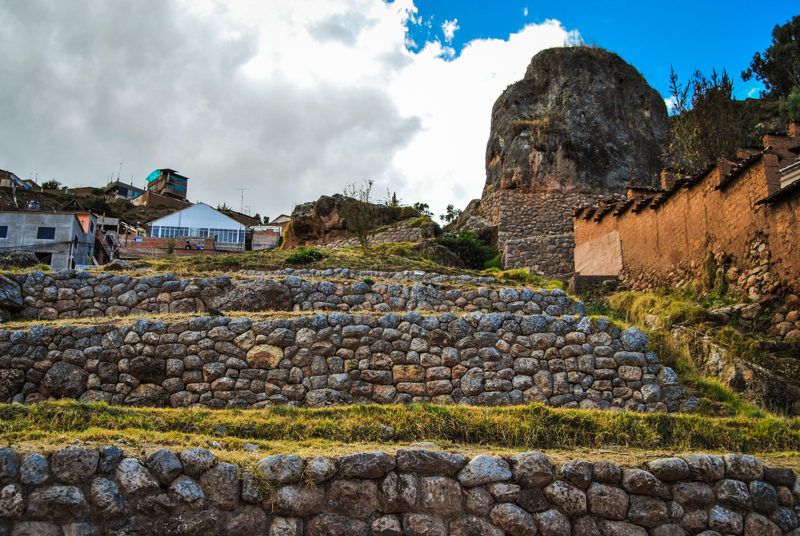 From Lucrepata, you see a series of terraces that rise upward, as if making a small pyramid. The terraces are split by a small stream that runs by the side up the large rock outcrop that rises to the sky. It sits on top of the terraces next to a sculpted and flattened rock, on the other side of the stream, from which the place takes its name today (Mesa Redonda). By the uplifted rock are several small but also significant rocks on the south side. Together the complex forms an image of duality and contrast, the flat platform rock, and the soaring stone separated by the stream. This is significant, since the idea of huaca, sacred place, may have something to do with splitting or duality. The stream comes down a small gorge from up mountain where one appreciates a series of caves. By the caves still remain some very fine stone-worked terraces. 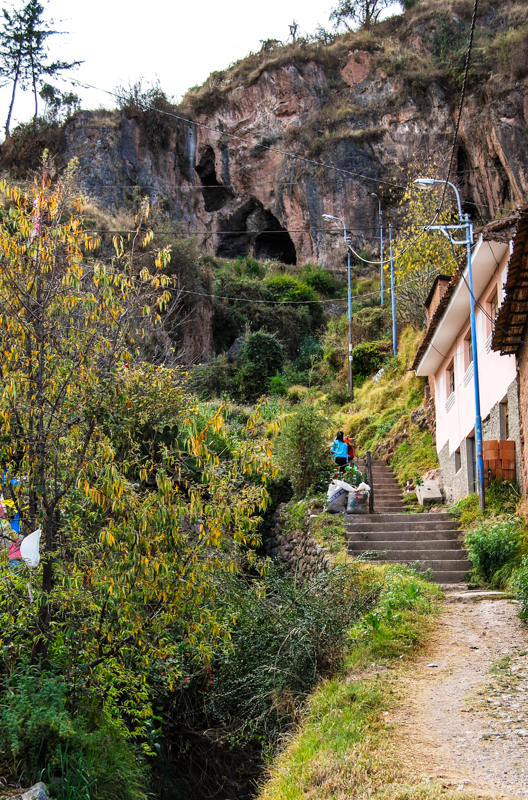 Today people say that the caves are where the Inca Pachacutec was buried, and where the Incas still live underground. These caves also house a once image of Christ which supposedly was a challenge to the primacy of Teteqaqa in the social organization of the are, largely supported by the inhabitants of an invasion, Ayuda Mutua, a neighborhood to their side of the caves and above Teteqaqa, according to anthropologist Abraham Valencia Espinoza. Together, Mesa Redonda, the caves, stream, Teteqaqa along with the current Church and Convent of Recoleta make a very large ritual complex, largely hidden and broken apart. This was probably a very important ritual center during Inca times and prior. To understand more about Mesa Redonda specifically, and perhaps to answer the question of why the whole seems so unknown and forgotten, we need to look at what a couple of archeologists have written about the site. The prominent US archeologist, Brian Bauer of the University of Illinois Chicago, has been a major force in grasping the archeology of Cuzco. In a work focused on identifying the various shrines organized into lines, ceques, stemming outward from the Temple of the Sun )now Santo Domingo= in the city of Cuzco, Bauer mentions Mesa Redonda. He insists that is is one of the ceques, and an important one. He writes that the flat rock, which is carefully sculpted, was according to historical documents, a platform where sacrificial offerings, such as llamas and more, were burned to share them with the divinities. 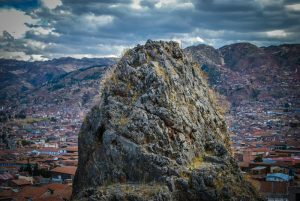 Bauer writes that flat rock is what in the Chronicles was called Pachatusan, making, although he does not say so, a relationship with the contemporary Apu , mountain deity, of the same name which rises over Cuzco. The neighborhood would also be Pachatusa n according to him. This is a very significant name, if Bauer is right, since it relates the shrine to one of the most imposing mountains near Cuzco, but it also means a place where the “illness” of time and space, that is the movements of both, can be ritually regulated and understood. As a result, the sacrifices burned there would be very important for ritual ends. While mentioning that this site belonged to the Huallas people who lived the before and during the Inca period, Bauer also claims the larger, towering stone is called “cinca”, nor nose. 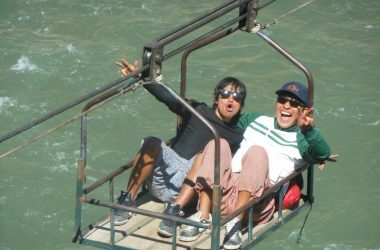 The word in contemporary Quechua would be senqa. The neighborhood where Recoleta is today was called, evidently, Munay Senqa (or Munaisenca) in Inca times and immediately afterwards. This word means beautiful or beloved nose. Intriguingly, Senca is also the name of a mountain that rises above the area and is very prominent. Again we find then a possible relationship with the srrounding Apus, or mountain deities. If true, this means that in this shrine we have models of two major mountains that could be ritually fed and controlled. This is significant. However the site, is divided by a stream. Bauer calls this ravine the stream occupies Chunchul and argues it relates to another very priminant site known as Autviturco, another important site. This is the cave from which the Huallas people were supposed to have come forth. It is their point of origin and hence very important. Seen from below, the tall rock takes the form of the cave openings above it, making the rock again enter into relationship with this place of origin, should Bauer be correct. Another archeologist, Germán Zecenarro Benavente, builds on Bauer and argues that indeed these caves are Autviturco and locates Mesa Redonda among the most important sites in contemporary Cuzco. However, there is another mystery, why if this site is so important is it not graced with a cross, like Teteqaqa, since the Spanish placed crosses on so many shrines? It is also mostly intact, it seems, and carefully tended, unlike Teteqaqa. The answer to these concerns may have to do with the Huallas. Are their descendents still among the people who inhabit the neighborhood by it, and do they maintain the memory of the place? Curiously, the tall stone is called a Condor today, rather than a nose, and the flat stone remains just an unspecified altar, in what I have heard. This transformation may be significant, as a way of transforming sacred items into folkloric things which do not require the attention of those who wish to maintain Christian purity. And, if the Huallas no longer live in the neighborhood, but have blended into the mass of unspecified Cusqueños, then that fact alone may explain why the site is not taken as a threat by Christianity and its guardians. In any case, Mesa Redonda is well worth a visit.